I am sorry I haven’t posted my findings sooner, however a very significant and wonderful lady in my life passed away and I have needed the time to gather my thoughts and celebrate her lifetime. Creation Phase: Using Photoshop the initial picture was created (see below). The actual activities were created and typed up in Publisher (we then published them as PDF files and placed them on our school portal). Using Dreamweaver we created hotspots for each of the circles that connected the level with the correct PDF file) and copied the code Dreamweaver created for us into our school portal. To keep track of the students progress we used the website Class Dojo and created the class, added the students and created our own badges/behaviours for each of the students “Smart” areas. Game Phase: The game had 3 levels represented by the dots. Level 1 the students had to complete all 7 activities starting with the area in which they were the ambassador. This level asked them to explore the celebrations associated with their smart area. In Level 1, students explored a number of different ways that we celebrate a wide variety of human achievements in different areas. 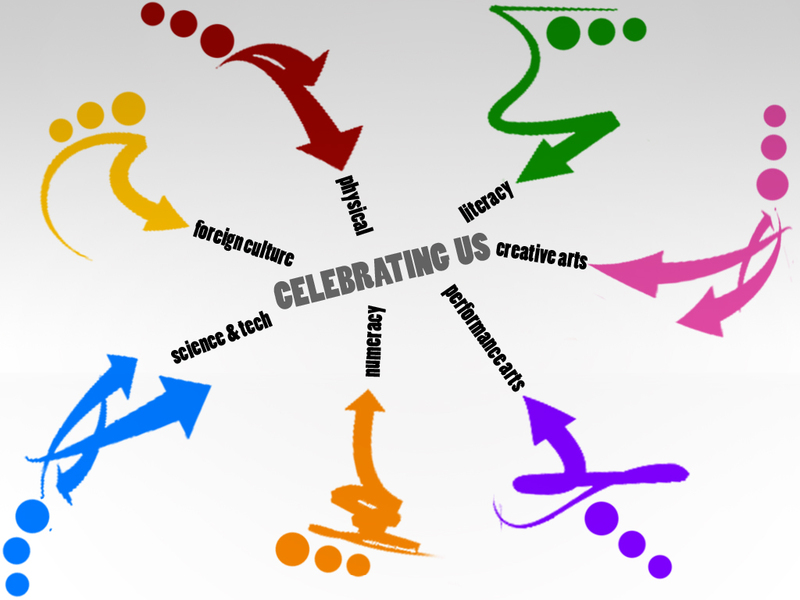 So for example the science and tech celebration was the Nobel Prize, the physical celebration was the Olympics. For Level 2 the students needed to complete their area followed by as many as they could complete in their class time of the other areas. Most students completed around half the activities. This level asked them to use various graphic organizers like the Alpha Brainstorming Grid, a Brainstorming Grid, Fishbone Brainstorming Framework, or a Y Chart. In Level 2, the students investigated what aspects of their smart areas of achievement we should focus on when celebrating humanity. In Level 3, each student represented their talent area in a group discussion. In this discussion the students planed a celebration of humanity. Each level was worth different points. There were bonus points for completing a level and for your own avatar, with teamwork and communication being rewarded with bonus points as well. The Verdict: The students seemed to enjoy it and the work was completed to a much higher standard than we normal had. The work was a little harder in the initial stages and keeping up with allocating the points to students. I think we need to create a better method of allocating the points however the students came up with some interesting ways to celebrate humanity in its entirety.